Our kitchen cabinets are the original cabinets that were built with our home back in the 70's. I would love to replace them completely, but that isn't an option right now, so I decided to jazz the old ones up a bit. Luckily, they are in pretty good shape, and the design is simple. They were already painted white, but they were in major need of a massive cleaning and a fresh coat of paint. We removed all of the doors and old hardware. Then we sanded and cleaned each cabinet door and all of the cabinets inside and out. After two coats of paint, in Behr's swiss coffee, and new hardware and hinges, in a brushed nickle finish, they were looking like this. Definitely an improvement but still lacking the character I was going for. 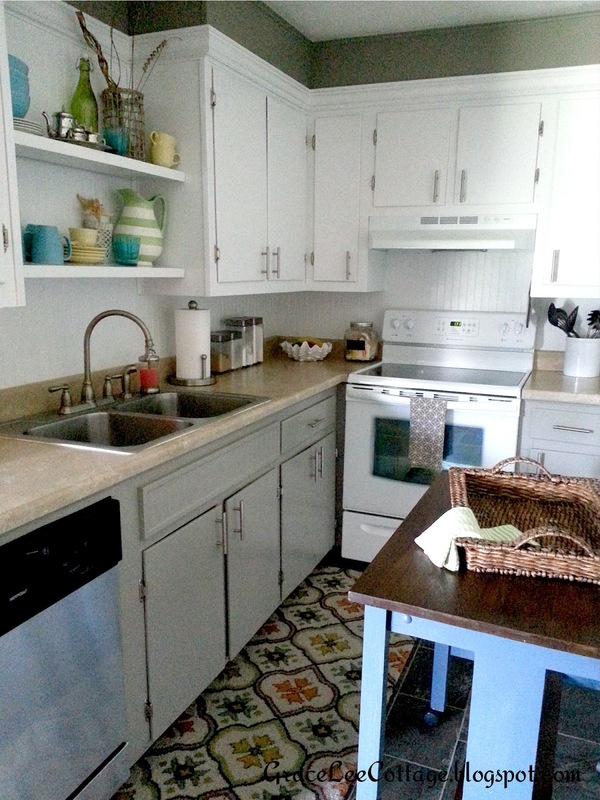 The more I looked at the scalloped piece above the sink, the more I disliked it. So we turned it into an arch instead in an attempt to make it look a little more updated. I also decided I wanted to go for a more open look so I removed a few cabinet doors and created a little open storage. The lower cabinets got a coat of soft blue/gray paint. I painted the interior cabinets the same blue/gray color as the lower cabinets. 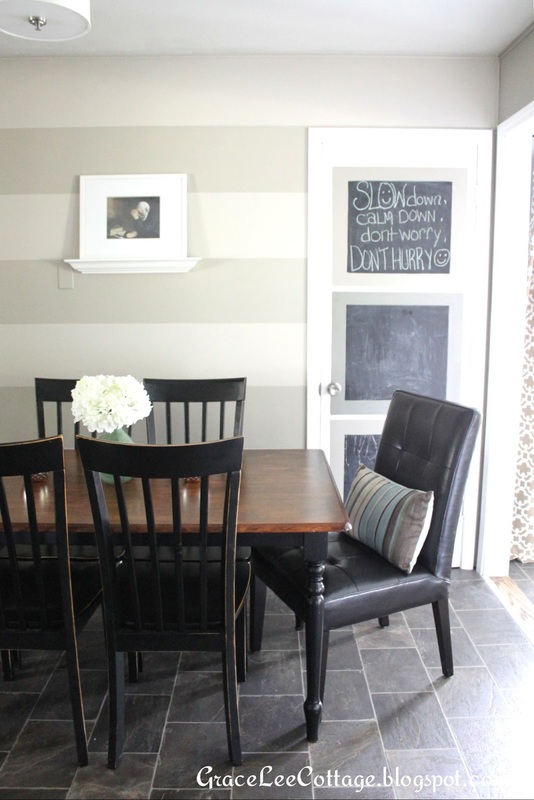 I was beginning to like the space a little better, but at this point I felt like it was looking to country cottage instead of the modern cottage look I was going for. So, on to the next project. We eventually removed the arch piece completely and removed the section of paneling that connected the two upper cabinets above the sink. Crown molding was turned upside down and added to the tops of the cabinets. We turned it upside down since there isn't any open space above our cabinets. It fit better that way. Ahh! Looking much better! 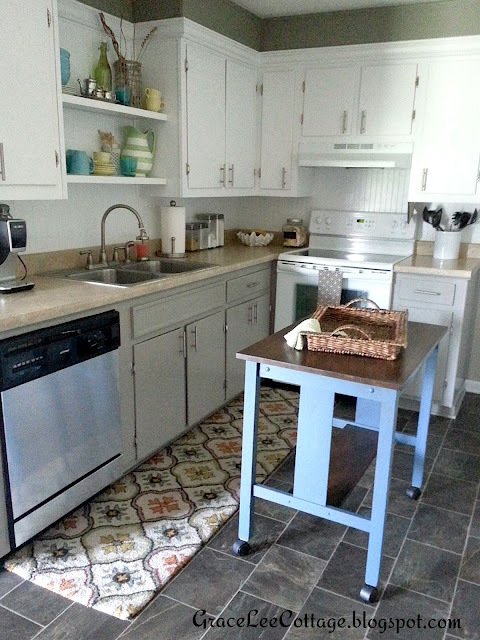 When we added our laundry room on a few months ago, unfortunately we had to lose the window. In it's place I opted for bead board along with a piece of crown molding to visually connect the two sets of upper cabinets. 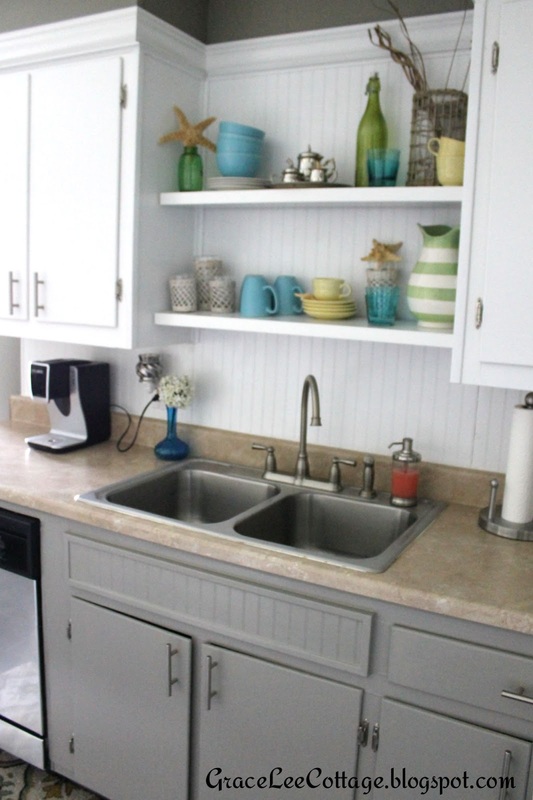 Then we installed floating shelves to give things a more modern cottage look. 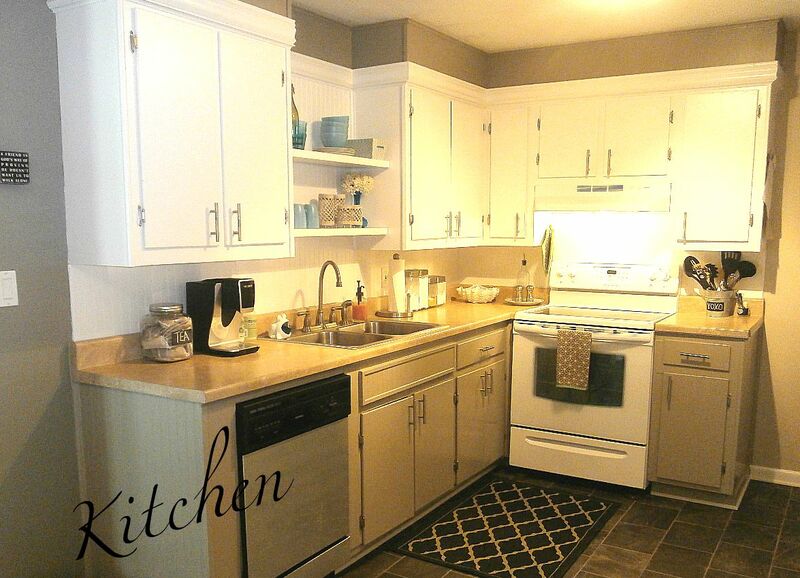 The combination of open shelving above the sink and open cabinets was just too much, so the cabinet doors were put back on. New door hardware, a fresh coat of paint on the lower cabinets in a more beige/gray color instead of gray/blue, and new flooring (it's actually vinyl!) and this kitchen is complete! Well, for now. 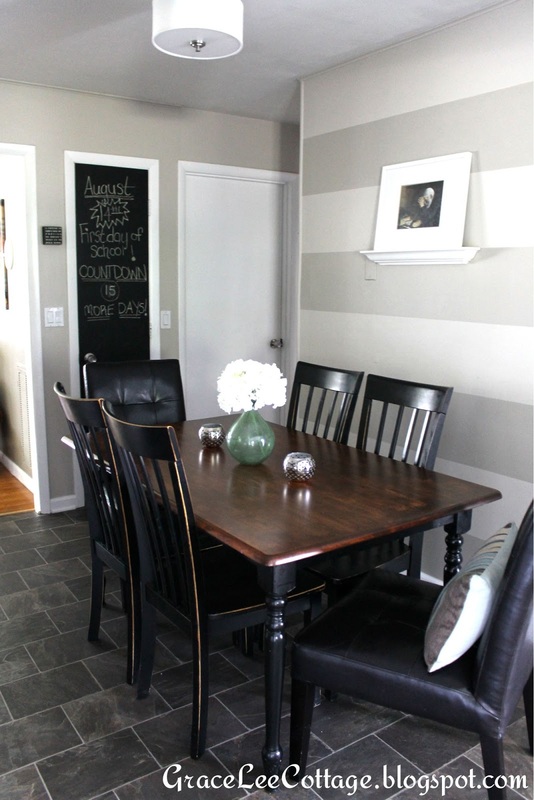 :) Oh and I also painted the wall you see here a darker gray color, and painted the upper cabinets bright white. Additional upgrades we made to the kitchen when we moved in were new counter tops, new sink and fixtures, new appliances, and a bead board back splash. This is what our kitchen is looking like now. I'm finally getting the modern cottage vibe I was going for! It was definitely a lot of trial and error to figure out what I liked and disliked, but well worth it in the end! Hey Vicky! Thanks so much, I'm glad you found me! 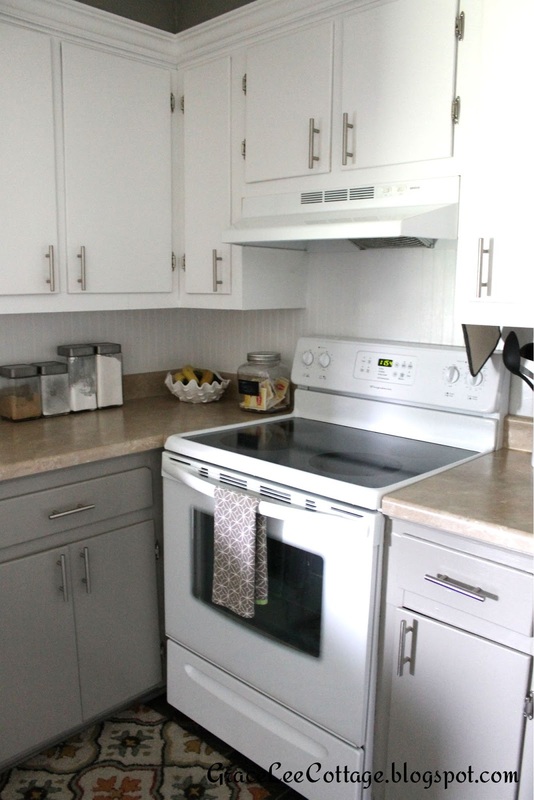 We are saving up for a remodel as well, but I couldn't stand to live with our cabinets the way the were before. It's amazing what a little paint can do! Have a great day and please visit again soon! Your cabinets are the exact look I am going for. I too have the soffit above my cabinets that has to remain. I am looking to add molding to the tops of the cabinet as well. Do you remember the name of the molding you chose? My soffit extends out farther than the cabinets do. Did you have this and if so, how did you remedy that so that the molding was flush with the cabinets and soffit? Thank you very much! Love your kitchen! Hey Pat! Thanks so much! Yes, our soffit extends out further than our cabinets as well, but I went ahead and installed the molding anyways. We actually used basic crown molding from Lowes and turned it upside down! We installed it just as you would any regular molding (flat against the wall) instead of at an angle like you typically would install crown molding. Since the soffit extends out further, it actually created the crown molding look I was going for, so it turned out to be a good thing! This was a complete guess and figure it out as you go project for us, but I'm thrilled with the results!, so I say go for it! Have a wonderful day! Your old hinges and pulls are the exact ones that we have. Since they mount on the outside, we haven't found anything to replace them with without having to take a notch out of each cabinet door. What did you replace yours with? Did you have to do any extra work to make them fit? Thanks!! Hey Marisa! We found those at Lowe's. They were super cheap and they come in two per pack. We didn't have to make any changes to the cabinet doors for them to fit, but we did fill in the previous screw holes that were on the actual cabinet with wood putty and re drill new holes to fit the new hinges because they were a slightly different measurement. Hope that helps! The floor is vinyl?! Please tell what make/model ... Great job! i also like the floor - please tell us where to find it! What did you use to cover the slits in the cabinet under your sink. We have the same exact slits in our cabinet, and I want to cover them with something. Thanks! Hey! We covered it with a small piece of bead board left over from our back splash, then we trimmed it out with some inexpensive trim. It made the biggest difference! 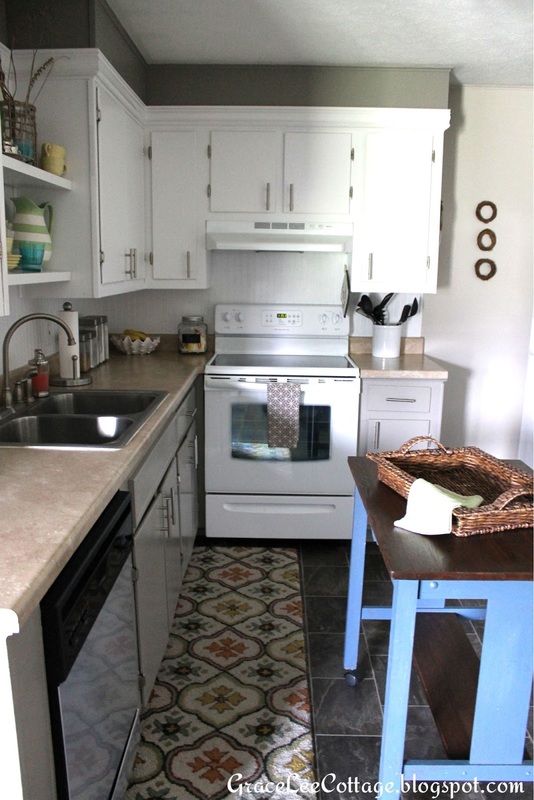 Where did you get the adorable rug in front of your sink? Great job!! Wow, I'm so sorry I missed your comment!! I know I'm way late replying but the rug is from Target and they actually still carry them! Hello, what color did you paint the lower cabinets??!! looking for the exact color!! Hey there! I wish I could tell you, but I can't remember! 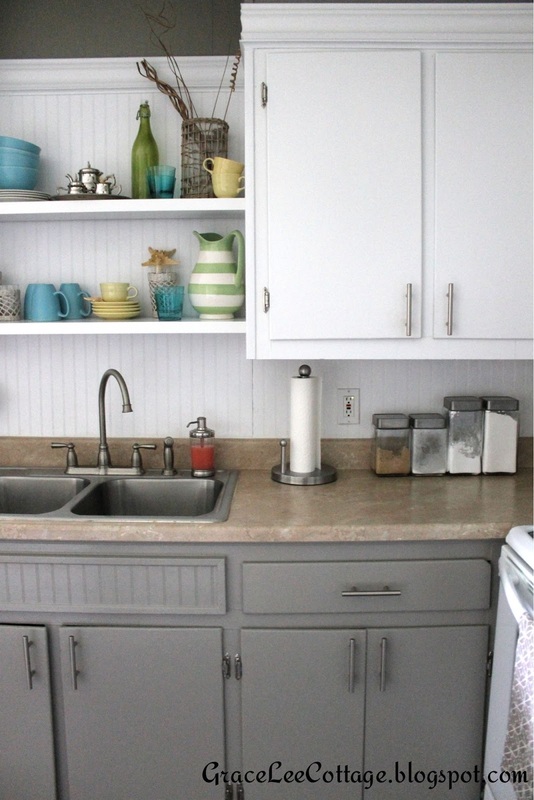 In our current farmhouse I painted the lower cabinets Valspar Java and it's very similar! I wrote a post recently and included lots of kitchen photos if you would like to check it out! ALiu I'm so sorry I missed your comment. We are no longer in this house so I don't have those measurements. I hope your shelves turned out great!! Best of luck! Hey Jessica, I'm so happy you were able to find some inspiration here! We are no longer in this house but the fridge was located on the opposite wall by itself, sort of in a recessed wall. I'll see if I can find a picture of it somewhere, I'm sure I have one. I can email it to you if you'd like? What beautiful kitchens! I like this look. Thanks for sharing at Home Sweet Home! 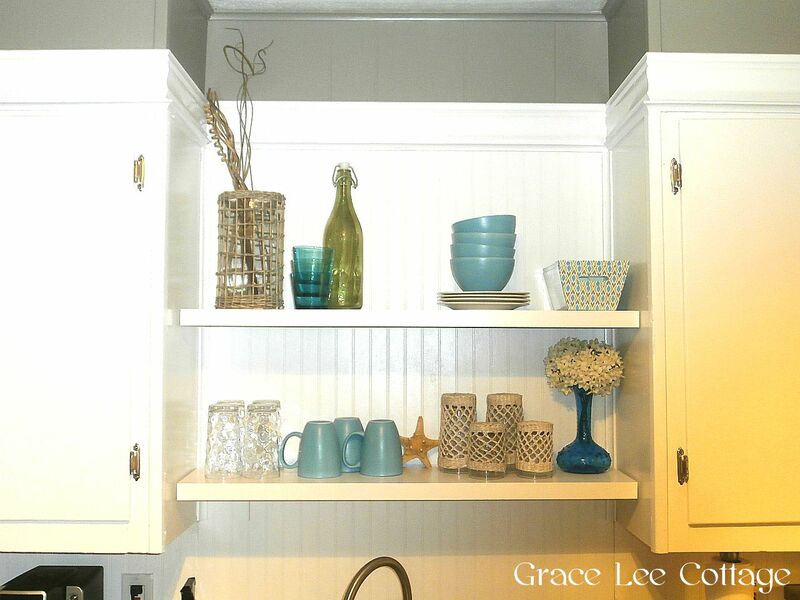 Hi Leah, Beautiful kitchen cabinets design! !I love the white...so clean and new looking. I am planning to upgrade my kitchen and will add new kitchen accessories .Definitely bookmark this post for further reference. We removed all of the doors and old hardware. 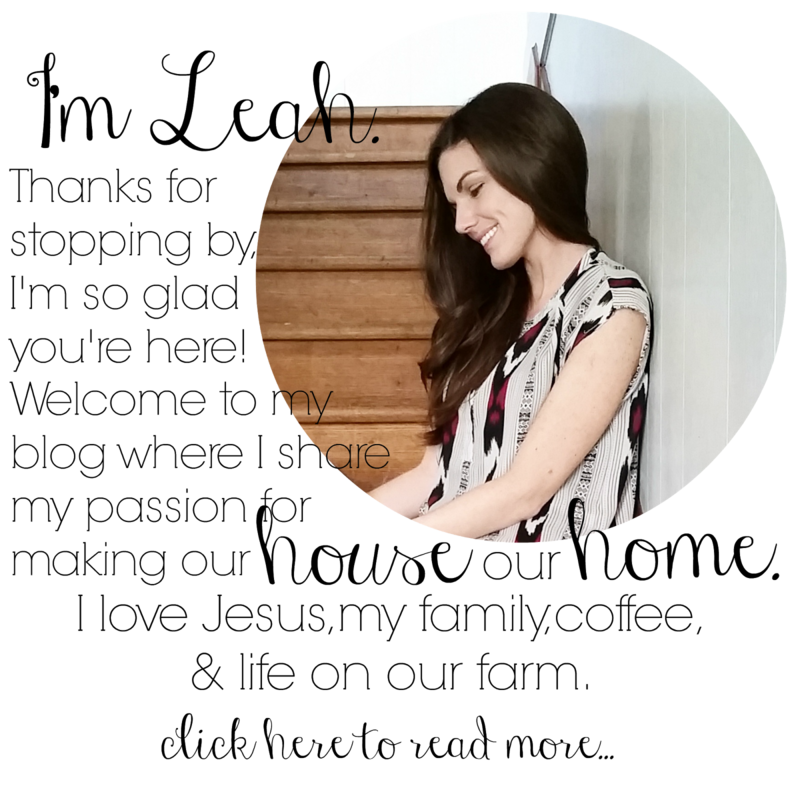 Interesting blog and I really like your work and must appreciate you work for the vintage window well done. I wanted to thank you for this great read here about the teak garden furniture I definitely enjoying every little bit of it.I have you bookmarked to check out new stuff you post. 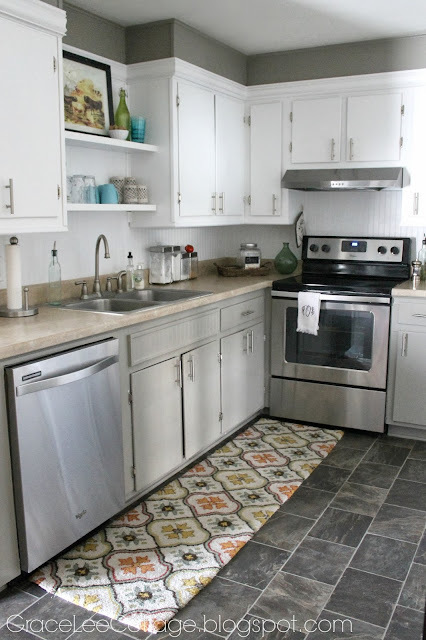 I think most people would agree with your awesome article which is specially related of remodeling kitchens and I am going to bookmark this web site so I can come back and read more articles. Keep up the good work! Really you blog have very interesting and very valuable information about the finance rattan furniture well done. nice post.. thanks for sharing such a detailed information. Thanks for great sharing! Visit my website Xưởng Nội Thất Hoàng gia!